SCVHistory.com BT1891 | Saugus | SPRR Saugus Depot with Dining Room, 1890s. Southern Pacific Saugus Depot, 1890s, with dining room. Exact date unknown. The dining room moved across the street to its own building in 1905 and became the Saugus Cafe. A notation in pencil on the front of this photograph says simply, "Pop." (See it in the original scan.) "Pop" might refer to the man standing by himself in the center of the photograph under the Dining Room sign. We don't know, but it appears to be Charles Edward Tolfree. We don't know his exact relation to James Herbert Tolfree, who founded diners inside Southern Pacific depots at Saugus, Mojave and Bakersfield, or to Joseph Herbert Tolfree, who ran the Saugus diner. There was a Charles Edward Tolfree who was born in New York in 1866 and died in California in 1924. Note the dog and the chicken on the platform, and the Waiting Room sign. When the Golden Spike was driven at Lang in 1876, tying together Los Angeles to San Francisco, and, in turn, the continent-spanning Union Pacific, it signaled an irreversible change in the lifestyle of the Santa Clarita Valley. The Saugus Train Station opened eleven years later on September 1, 1887 when the spur line to Ventura was completed by Southern Pacific Railroad. 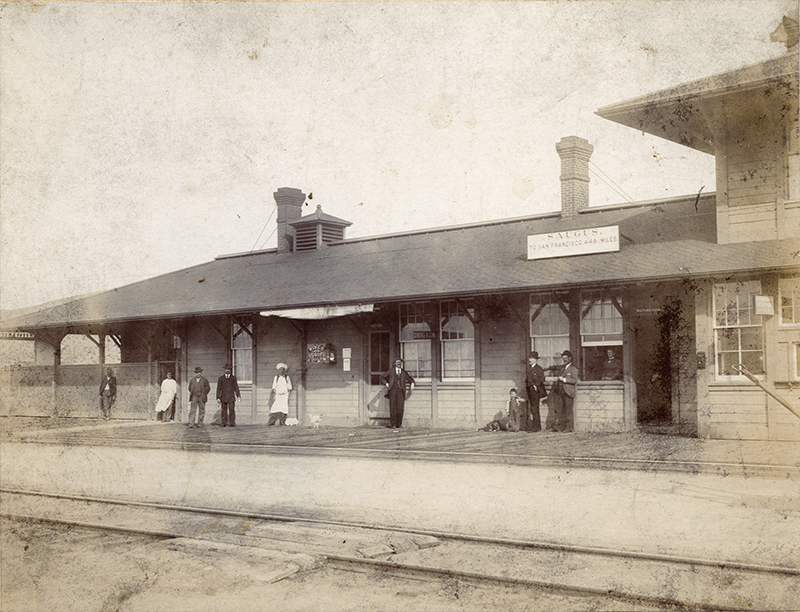 In order to accommodate hungry travelers, Tolefree's Saugus Eating House was established at the north end of the depot. It was taken over by Martin and Richard Wood in 1898, who changed the name to The Saugus Cafe. By 1905 more room was needed for additional storage of freight at the Station, so the cafe moved across the tracks, where it stands today. Cowboys would occasionally shoot up the Station as their way of greeting the trains. There were robberies, too, the most famous being the night in 1929 when Thomas Vernon derailed and looted Engine Number 59. President Benjamin Harrison stopped over in April, 1891, and Theodore Roosevelt was met by Governor Henry T. Gage here in 1903. The last passenger train that stopped at the Station during April, 1971 and the last freight train was discontinued in 1979. 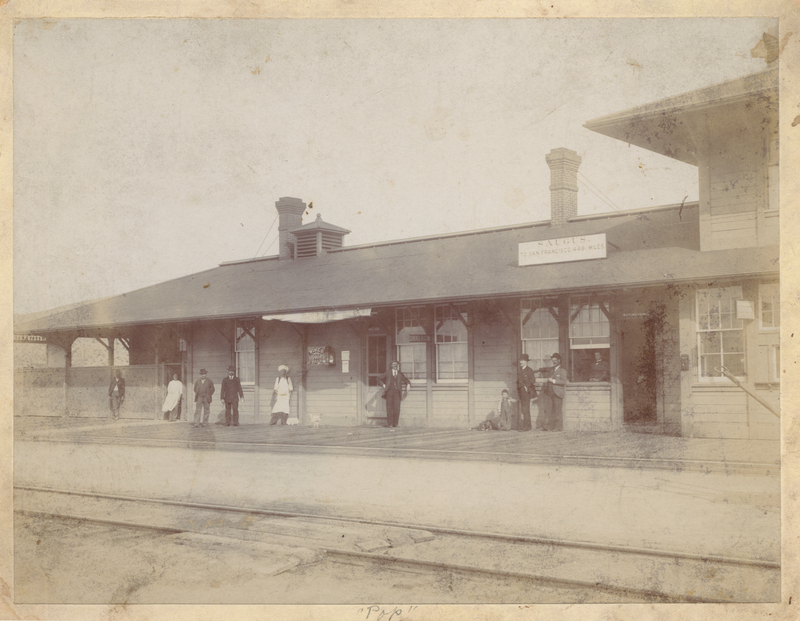 The depot was closed on November 15, 1978 by the last Agent, Mr. James Guthrie. Through a massive community effort, the building was saved and moved on June 24, 1980 to its present location on land leased from Los Angeles Country within William S. Hart Park. The Saugus Station has been featured in a number of motion pictures, television shows, music videos and commercials. Films include "The Pilgrim" (1919) with Charlie Chaplin, "Suddenly" (1954) starring Frank Sinatra, and most recently "The Grifters" (1989) starring Angelica Huston and John Cusack, and many student projects for area film schools. BT1891: 9600 dpi jpeg courtesy of Beth and Charles Tolfree.